As we shake off the dregs of last week’s “bomb cyclone”, it seems an appropriate moment to recognize the most recent labors of the Burke’s student workers. By the end of his time processing archival collections in the library this December, Columbia Religion PhD candidate Andrew McLaren had processed a rangy, exceptionally complex number of collections at Burke. At the end of his time in the library this December, Andrew wrote the following reflection of his experiences processing and getting to know some of our library’s distinctive collections. Warmest thanks to Andrew for his wonderful work these past months. Thanks also belong to Primary Source Internship and the Henry Luce Foundation, whose support facilitate the processing and access of collections like the Donald Shriver and Harrison Sacket Elliott Papers can be effectively processed for use by future researchers. As a primary source intern at the Burke Library of Union Theological Seminary, I have processed four collections of archival documents. Addressing both conservational and organizational issues, I examined, described, and re-housed thousands of documents, photographs, and other materials. Drawing on substantial work done by earlier archivists, I updated and completed the processing of three existing collections: the papers of William Walker Rockwell, Henry Boynton Smith, and Harrison Sacket Elliott. Each of these collections documents periods of growth for Union Theological Seminary. Henry Boynton Smith (1815-1877), educated in Europe, was among the Seminary’s most active librarians, pushing considerably for an expansion of its holdings with more rigorous scholarly collections. William Walker Rockwell (1874-1958), a scholar of church history, oversaw another significant expansion of the library, including the housing of the Missionary Research Library collection at UTS. He also aided with the library’s pioneering re-organization into an expansive research collection under the great librarian Julia Pettee in the early 20th century. Harrison Sacket Elliott (1882-1951), a former missionary in China and an active member of the YMCA, pushed the boundaries of theological education into new territory, extensively exploring the relationships among theology, education, and psychology and helping to re-make UTS’s place in religious education in America. 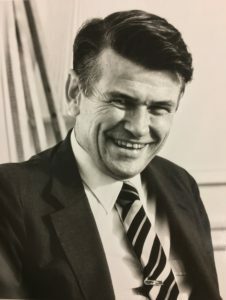 The bulk of my time, however, was devoted to processing the papers of the 13th President of Union Theological Seminary, Professor Donald Woods Shriver, Jr. (b. 1927). President Shriver is well-remembered for navigating a stretch of financial difficulty for the Seminary. Moreover, his vocal advocacy for the importance of ethical thought and critical remembrance is well-known, culminating in his 2005 book, Honest Patriots: Loving a Country Enough to Remember its Misdeeds, which earned President Shriver the Grawemeyer Award in Religion in 2009. Moreover, the extensive collection of notes from both his own education (including coursework with R.R. Niebuhr, Talcott Parsons, and Robert Bellah) and the courses he taught as a professor at Union provides a window onto a formative period of theological and religious studies education in America. Internationally engaged, ethically minded, and publicly active, President Shriver’s legacy represents rather aptly the educational values of Union. Donald Shriver Portrait. UTS2. Faculty Photographs: Pres. Donald W. Shriver. As a student of early Islamic history, I’ve learned that certain kinds of distance are part of the work: temporal ones (between now and the 10th century), spatial ones (between the Burke Library, and, say, Baghdad), and material ones (between manuscripts and printed editions). I applied to the primary source internship hoping to develop a clearer insight into the relationships between the interpretation of texts and their physical histories. Although the contexts are entirely different, thinking about how the written traces of someone’s life’s work are distilled and distributed neatly into folders and boxes is not unlike the way one must think through the construction of a text. In my research on early Islamic historiography (i.e., the study of how people understand the past and talk or write about it), I’m often hunting for minute hints of how scholars assembled their texts. This can be extremely difficult for eras in which relatively little textual material survives. In a sense, it’s impossible to check the work of our historians, because their resources have often disappeared (in the hubbub of an ancient library, in a fire, in a worm’s stomach). As one of my professors often opines, he’d use a time machine not to alter the course of history, but to have a bit of conversation with al-Tabari, the great 10th-century historian, and a peek at his personal archive. In the meantime, we have to read very carefully for the “seams” of the text—moments of disagreement, patterns in language usage, or anachronistic references can all prove significant for imagining how the surviving text was assembled. As an intern working on processing papers, I stood at the opposite end of that process. The papers of Smith or Rockwell are fragments of story, waiting to be sewn together. And since one of archiving’s imperatives is preserving a sense of the papers’ provenance, organizing documents and photographs in a neutral way that keeps context in focus but bows to a logic requires careful thought. A keen observer might already be able to see the rudiments of a story in the way a collection is organized (this is perhaps especially true, given our propensity for thinking about things in chronological sequences). Of course, the second side of the coin is the difficulty of even wrapping one’s head around all the accessioned materials (for instance, President Shriver’s papers arrived in 30-some bankers boxes). Where do you start if you don’t know the beginning of the story? Ultimately, the archive points toward the power of the organizing narrative. Six dozen document boxes sitting quietly on the shelves can’t tell their own story; 1700 photographic negatives themselves can’t recount the past without a little light shining through them. In this idea, there is perhaps a rather poetic connection to President Shriver’s work on the significance of communal memory, particularly of the shameful past. Because our stories obscure as easily as they reveal, it is the narrator’s task to tell a story that takes account not of who we wish we had been, but who we must be in the future. Andrew McLaren is a Ph.D. candidate in the Department of Religion at Columbia University. His dissertation research focuses on a historiographical text about conquests and politics in the first three centuries of Islam, as well as its reception in various geographical and linguistic contexts and understandings of history. This entry was posted in Collections on January 12, 2018 by Rebecca Nieto.